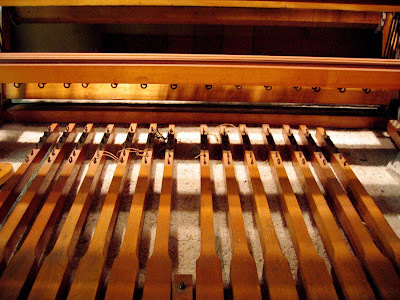 My 60" 8-shaft LeClerc loom (it's an 8-shaft Nilus) will have its own room. 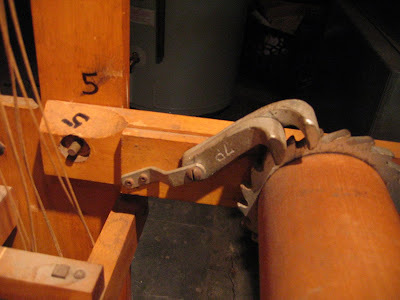 I christen our second bedroom "The Loom Room." Chris has disassembled it and made a numerical key for reassembly at the new place. In the meantime, I'm working on a few new designs... here's a tiny preview. 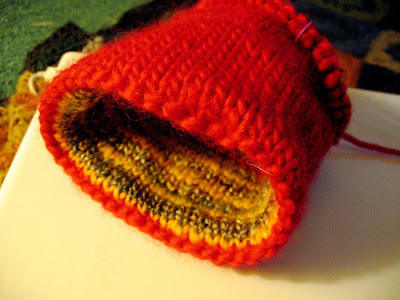 How I love a turned hem! 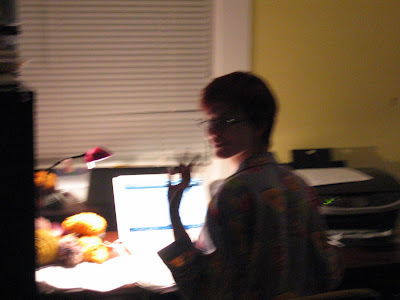 It's actually liberating to only have ready access to the yarn for two design projects; I'm flying through them. Our upcoming move provided the appropriate motivation for refinishing a hutch we bought at the Salvation Army a few years ago. 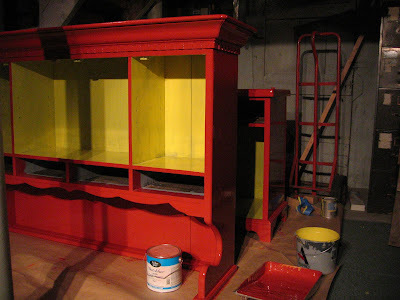 Chris and I had discussed painting it red... but I mentioned that I might like it if it were yellow... and then Chris said "I was planning on red with yellow on the inside." 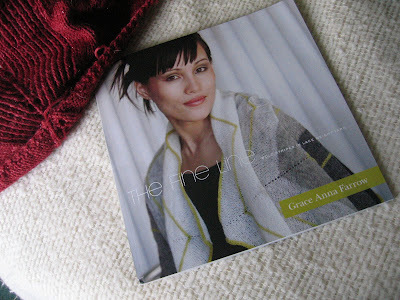 I also made something for the Holiday Issue of Interweave Knits; the preview went up today. I always like the Holiday IK the best of all issues, and now I'm part of it! Those pajamas say "Cocktail Hour" on them. When I wear them, it is. 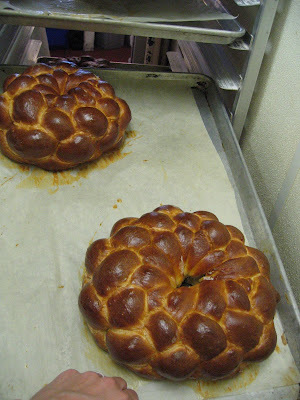 In celebration of Yom Kippur (okay, I don't celebrate, so let's say in order to facilitate others' celebration of Yom Kippur), we made a bunch of special round challah braids at the bakery this past Sunday and Monday. 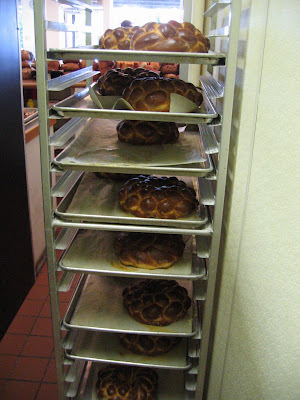 On Sunday I worked from 12:30 am to 9 am to get the braids out right when the bakery opened. Here's a glimpse of the pre-shaped braid segments; there are 6 in each braid, and we roll them a bit and let them rest so they're easier to roll out really long. My coworkers Ben and Ali are preshaping. Those are braids that I made on Monday when we were down two people (it was just Ben and I, with a little help from Styves who was running the oven. Round challah braid emergency! Round challah braid panic!). 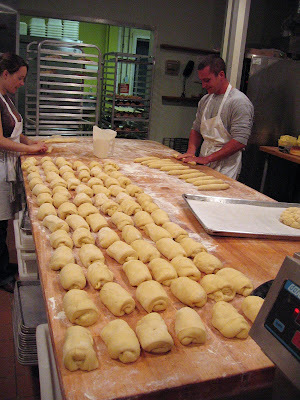 Ben pre-shaped and I braided... fitting in 26 round braids in addition to all the regular bread shaping and mixing. You don't know how hard and fast you can work until you just do it sometimes. 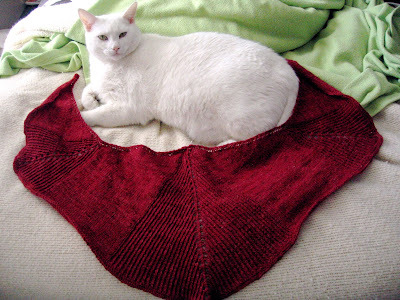 Things I'm knitting: An almost-complete Herbivore shawl by Westknits. The yarn is Elemental (merino/silk/some silver!) 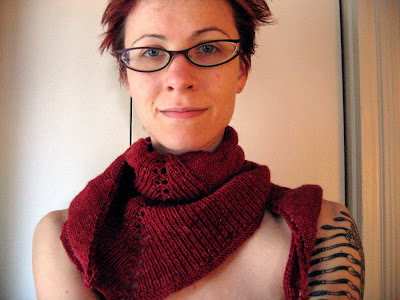 by Yarn Hollow in Chili Red. 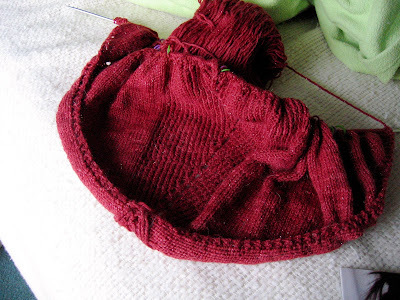 I love it, but the twisted stitches make it more time-intensive than I initially projected. Oh, who am I kidding. I've been busy and usually nod off when I sit down to "relax" lately. This book! Seriously!!! I can't stop looking at it and flipping through it and dreaming about making every one of the designs. The drama of it! The simplicity of it! 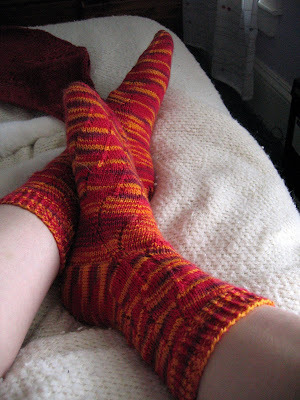 The patterns are very well written and quite simple... they make me want to stop designing for a while to give me more time to knit progressive chevrons. Seriously, when you look at the patterns and flat views in the book, there are all sorts of asymmetrical and progressive elements going on, things I've never seen before. After I move I'm treating myself to the yarn for the shawl of my choice. Speaking of, a huge THANK YOU to all the knitters who made the yarn sale such a success! I hardly have anything left, and what's left will go to charity knitting. 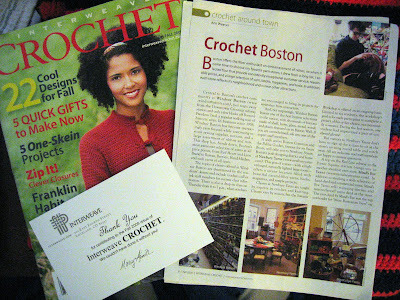 I met some very cool people and feel I passed on some love with all that yarn.